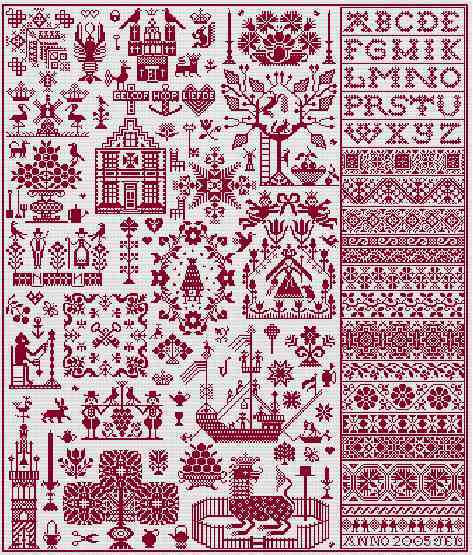 This design is made up of many traditional sampler motifs from Holland and the Low Countries and the band of patterns to the right of the design is also a typical feature of samplers from this region of Europe. The Dutch Maiden (or Free Maiden) usually holds a sceptre in one hand and the Cap of Liberty circled by a ribbon in national colours in the other. Generally she is accompanied by a cat, a creature that never gives up its independence. The Dutch Lion and the Spinning Hat symbolises strength and steadfastness. They are set in the Garden of Holland (symbol of the Royal House of Orange) which is circular and enclosed by a fence. This motif dates from 1405-6 and is connected with the siege of Hagstein which was protected by a hedge of woven branches. A relatively recent group of symbols are the Cross (Geloof – faith/belief), Anchor (Hoop – hope) and Heart (Liefde – love/charity) which became popular in the first half of the 20th century. They were often embroidered on headdress ribbons, particularly for weddings, as were many of the patterns on the right hand side of this design. The Spinning Monkey is always seated and was lined with the Three Fates who foretell the lot of man and spin out the threads of their lives. The gabled house was often the home of the embroideress and the chairs represented diligence and hospitality. This design was named after the birthplace of my grandfather Theodore Johanne Hubert Hendriks. Bois le Duc, the provincial capital of North Brabant in Holland is known today as ‘sHertogenbosch and was a fortress city until 1876. It was also the birthplace of the painter Hieronymus Bosch which explains a lot!